Make: Rockets, Down to Earth Rocket Science, is for all the science geeks who look at the moon and try to figure out where Neil Armstrong walked, watch in awe as rockets lift off, and want to fly their own model rockets. Starting from the ground up you how to build all sorts of rockets and associated equipment with clear, step-by-step directions. It's easy to skip the more detailed material, but when you are ready, Make: Rockets will help you rise to new heights with detailed coverage of the math and science behind building, flying and tracking rockets. * How to safely build and fly solid propellant, water and air powered rockets. * All the techniques needed to build model rockets, launchers and trackers. * How to recover rockets by parachute, streamer, glider, helicopter recovery and more. * How to fly payloads like cameras, altimeters and the ever popular egg lofter! * How to pick the right motor and parachute for any rocket or payload. * Aerodynamic principles for designing stable, low drag rockets that slip through the air--including one rocket that can hit 500 mph! * How to use free rocket simulators to figure out about how high a rocket will go before you fly it. * How to track the rocket and figure out how high and fast it really went. 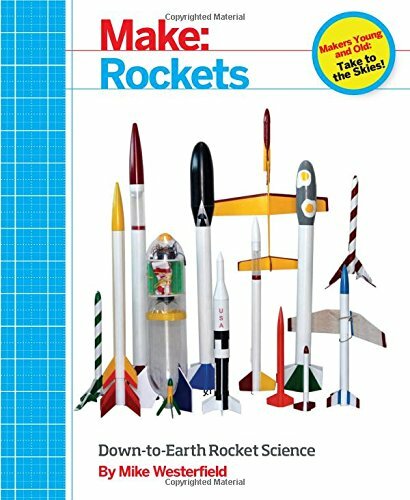 If you are a hobbyist just getting started with rocketry, a teacher or parent looking for ways to get kids interested in math and science, or an advanced rocketeer who wants a deep understanding of the science and math behind rocket flight, this book is for you.